Everyone is guilty of hoarding things from time to time but some waste operators can take things too far. It is one thing to hoard old photographs or a couple of coats, but it’s not often that this has an impact on anyone else. We were alerted to a hoard of a different sort, one where a second-hand store owner claimed he was supplying furniture to TV show Inspector George Gently. We investigated the case following concern raised by a council neighbourhood warden in County Durham. I head up a waste enforcement team at the Environment Agency in this area. The warden was worried about a site in South Moor, Stanley, which was being used by the shop owner to store ‘overspill’ from his business. Christopher Williams, of Acton Dene in Stanley, had been seen bringing back items including wood, curtain material, bedroom furniture, plastic, carpets and old computer monitors. But when asked, the 56-year-old said he was storing items not viable for sale. 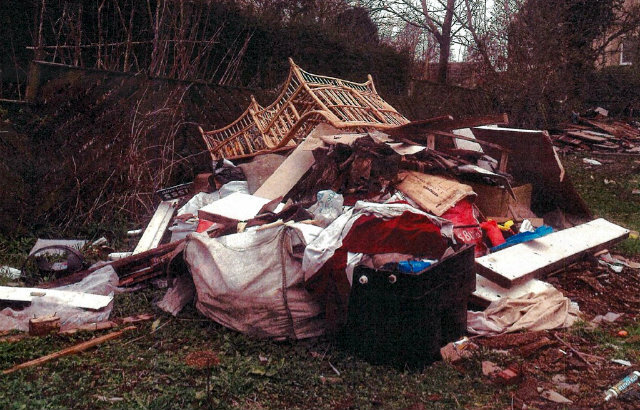 Concerned about the waste on site and its untidy state, the warden contacted the landlord who paid to have a large quantity of the waste removed at his own expense. Williams had permission from the site’s landlord to use a garage and part of the property. When we visited the site, we found the garage was full of mixed waste. We also discovered an invoice and letter, which was traced back to a homeowner who had paid Williams to take away her old furniture. We support businesses who handle waste legally, but we are tough on those who persist in operating outside the law. Williams was one of those people. He was previously convicted in 2014 for depositing and burning illegal waste. Any repeat offence is treated very seriously by both the Environment Agency and the courts. Mishandling of waste can have a major impact on the people who live nearby as well as the environment. Some waste dumps can contain pollutants and also pose a fire risk. Following our investigation, Williams pleaded guilty to a charge of illegally sorting and incinerating waste between 1 December 2013 and 30 April 2014. The court heard how a fire at the South Moor site burned for more than three days and led to a neighbour having to seek medical treatment for asthma. In mitigation Williams said that some of the furniture in the photos shown in court was not waste and had been supplied to the producers of Inspector George Gently. However, the court heard that he couldn't produce any evidence to back this up. Williams was sentenced to 18 weeks in prison, suspended for 12 months and ordered to pay £4,000 costs. He was also ordered to pay £400 compensation to the owner of the land for waste clearance and £150 to a neighbour who suffered health problems from the effects of smoke. This wasn't a case of hoarding a few memories which had got out of control. Waste crime can have a detrimental effect on local communities and undermine legitimate businesses which pay for the correct permits to stay within the law. Anyone who has information about waste crime can call Crimestoppers on 0800 555 11.